It’s no secret I love to read–poetry, fiction, memoir, philosophy, history, biography, mushroom field guides, anything–as long as it’s well-written. I can’t choose a favorite genre, but an exceptionally great cookbook would always be at the top of my list of favorite reads. The writer has enough skill to transport me into a food reverie, with more than just good recipes. The stories and descriptions should make me think of people I love, make me remember the times I’ve delighted in my precious peoples’ company, make me envision us together tasting the food I’m reading about. Mouth-watering photos help but are not essential. Sometimes whimsical illustrations are enough, especially if the writer has the magical poetic sensibility to make sensory experiences from words, connecting the images to pleasant emotions that stir my memory. Always, the cookbook has stories themed around place or culture. There’s no formula for this, but good food writers always make it happen. A good cookbook makes me want to gather my tribe together. 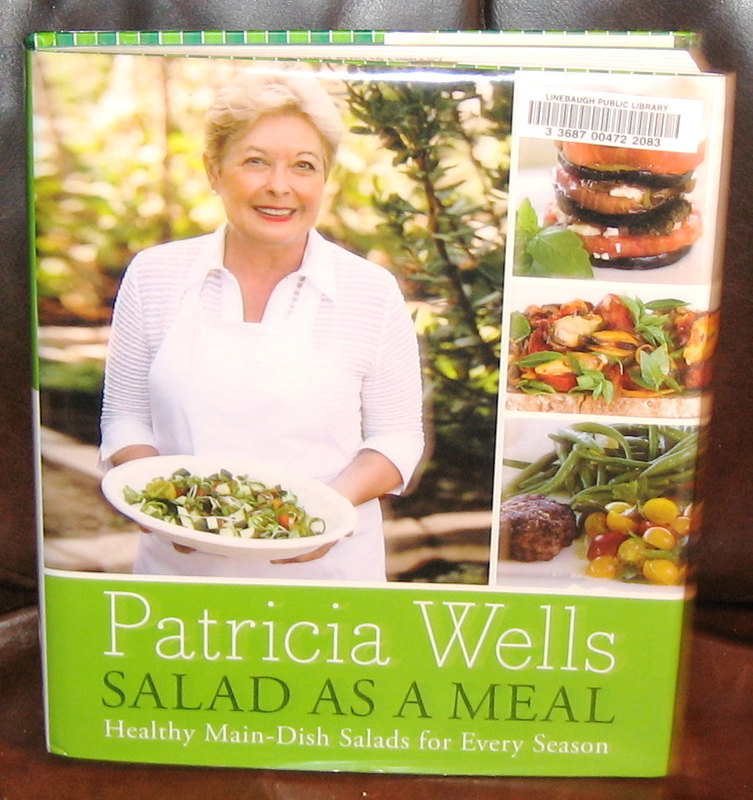 For example, just this morning I was reading Patricia Wells Salad as a Meal. When I got to her felafel recipe, it made me telephone my brother, who introduced me to falafel more than twenty years ago when we were twenty-somethings. He had been living in New York and was crashing on my couch for a few weeks while transitioning into a new adventure. It was the best month of that decade of my life. I’d often come home from work to find him cooking up something delicious (like felafel). We’d stay up half the night talking. He lives nine driving hours away from me now, and I sure miss him. A really good cookbook motivates me to put down the book and get into the kitchen. Right now, I’m looking forward to a day of cookbook reading interspersed with cooking. It’s one of the most relaxing things I can do–but honestly, most of the cookbooks I bring home from the library or bookstore are not all that great. I’d love it if you could lead me into new cookbook territory. What do you look for in a great cookbook? Which food writers, in your opinion, are able to transform a collection of recipes into good literature? Previous postLeaders, we need YOU! I am an avid reader of cookbooks, and have been for a very long time! I tend to prefer older cookbooks than newer – like Fannie Farmer’s Cookbook, my beloved vintage Joy of Cooking etc. I find them fascinating to read – like looking back in time. The ingredients are different, the type of recipes are different – I just love old cookbooks! I also really like Nigella Lawson’s writing. And of course Mark Bittman…I could go on and on! But I have to say, one of my favorite cookbooks is Vegetable Love by Barbara Kafka. It doesn’t have any photos, but it one of the most complete cookbooks I’ve ever read. Everything you could ever want to know about vegetables – and a ridiculous amount of recipes. It’s a great read and very inspiring to cook with. I also like Deborah Madison’s Vegetarian Cooking For Everyone. Very well written and great recipes. I feel the same way you do about decades-old cookbooks–the snapshot they offer into another time. It always surprises me how rapidly trends and tastes change. I often refer to my tattered copy of “The New Basics” by Rosso & Lukins. Published in 1989, it feels dated, almost nostalgic to me already. I’m almost always the last to know–would you believe I’ve never heard of Mark Bittman? Thanks for leading me into new cookbook territory. What a great way to look at cookbooks! I have very little kitchen experience and frankly, not much interest in cooking (but I love baking, and I’m growing to like cooking a little bit more with each passing year). I have only used very utilitarian cookbooks, but would love to read the types of cookbooks you describe. I have to admit my favorite cookbooks are the ones compiled by churches or banks or schools as fundraisers. I’m a huge fan of Midwestern comfort foods like hotdishes and dessert bars and those types of cookbooks are a treasure trove of such recipes! I enjoy making recipes that have been passed down through the generations and involve simple, natural, earthy ingredients. I like making cookies with the same ingredients my grandma would have had in 1933. There are some really great books about how cooking has changed through the decades (of course none of the titles are springing to mind and I just discovered that my Tennessee library account does not give me a neat bibliography of all the books I’ve ever checked out–Bah! My Wisconsin library account did!). I’ve had a love affair with cookbooks since I fell in love with reading when I was six, and the only books in our house were the World Book Encyclopedia, The Bible, and 2 cookbooks. Better Homes and Garden; and a file box whose contents enlarged by 20 every month, full-color plastic-coated cards of recipes of the month–things like porcupine meatballs and chicken aloha (because it had pineapple). During my childhood I read what was there for me to read, over and over, cover to cover (and card for card). This partially explains everything about me. Chicken aloha! That sounds like something Midwesterners would totally make to be “ethnic”–just add pineapple! Totally, but Aloha sounded so sophisticated and exotic to me when I was 8 years old in 19-hundred-so-and-so (I’m not going to admit how very old I am, and how provincial I was). There is just something to cookbooks that is mesmerizing. I need good photos, I am a very visual person, so for me it is imperative to see what is being described. I enjoy when a cookbook author has a vision, a thread that runs through the cookbook. It does not necessarily have to be themed around a particular cuisine or ingredient, it is more what is driving the chef, why is he cooking the way he is cooking. I have been most impressed with Tom Kime’s first cookbook, called Exploring Taste and Flavor. He was trained mostly in South East Asia and has brought that idea that, I believe runs through most major cuisines, that a balance of sweet and sour, salt and bitter creates a flavorful dish. He explains the recipes quite well, the stuff he makes is super interesting and tasty, and somewhat off the beaten path, and he always gives me options on what ingredient can be replaced with what. Really cool and good cookbook. But, my favorite cookbook of them all is actually an online blog that has not been fed in 3 years now (no one knows what happened to him). It is called fxcuisine.com; a Swiss finance guy whose hobby is cooking, mostly country style French and Italian. He turned his kitchen into a photo study and takes stunning shots of his steps. The recipes are outstanding, incredibly good. His boeuf bourguignon is the best I have ever had (and I have spent considerable time in Burgundy!) and I have been serving it for years now. His penne con zucca are gorgeous in their simplicity and taste…I love his blog so much, and it pains me that there has been nothing, no news, for three years. Makes me think the worst…but his recipes live on! OMG! I am so excited about this!!! You’ll get the goods very soon… (probably in installments, because it will take me while to write out the whole yummy meal. The potatoes are quite easy, and incredibly perfect with schnitzel. Blew Ken’s mind. I riffed on a Patricia Wells recipe). As I indicated, take your time. I am really looking forward to it. His name is Francois Xavier, that is all I know. I don’t think I saw his last name ever…and it is very true, quite the blog legacy he left there.